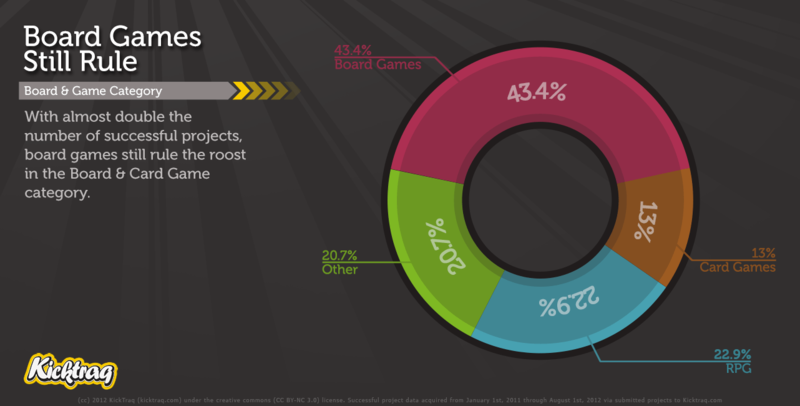 For those board gamers among the sea of Kicktraq data addicts, you’ve probably heard of Gen Con. You know, that little convention in Indiana with about 35,000 board gamers all crammed into the convention center for 4 days. Yeah, that one. It’s currently t-minus 7 days and counting. Can you believe it? Unlike past years where I wanted to go but wasn’t able, this year I’ll actually be going! I’m excited to be able to touch base and chat with all the projects I’ve watched over the last year and the folks I’ve interacted with online. If you’re going to be there, hit me up on twitter or the contact form and I’ll make time! I’d be truly honored to meet you in person. 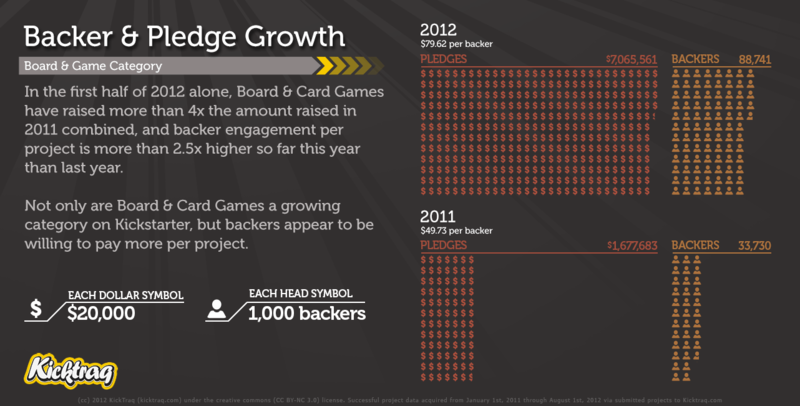 So, In honor of the Gen Con festivities and for all my loyal data addicts, I’ve put together some fun infographics about the massive growth of Board & Card games on Kickstarter in the past year and how it compares to last year. I’m releasing these all under Creative Commons (CC BY-NC 3.0), so hack up and share away, just remember to give me a hat tip (and I’d love to see it if you’d be willing to share!). All data used was gathered from successful project data from January 1st, 2011 through August 1st, 2012 via submitted projects to Kicktraq.com. 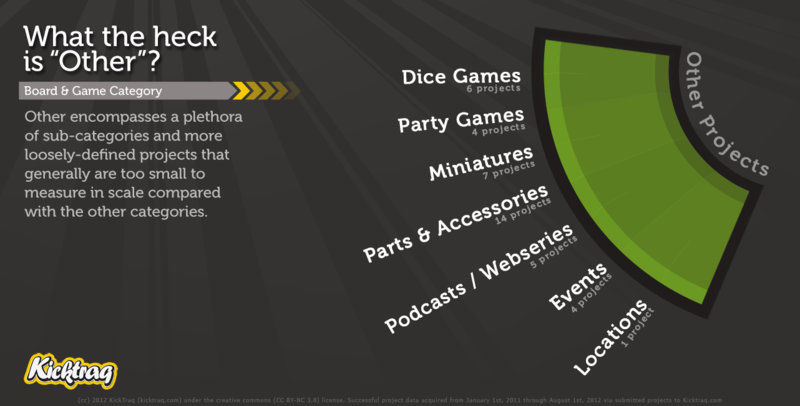 Categorization of gaming projects is completely arbitrary and my personal opinion as Kickstarter has no official category segregation of the various sub-genres of games that exist in the world (yet). Please let me know what you think! 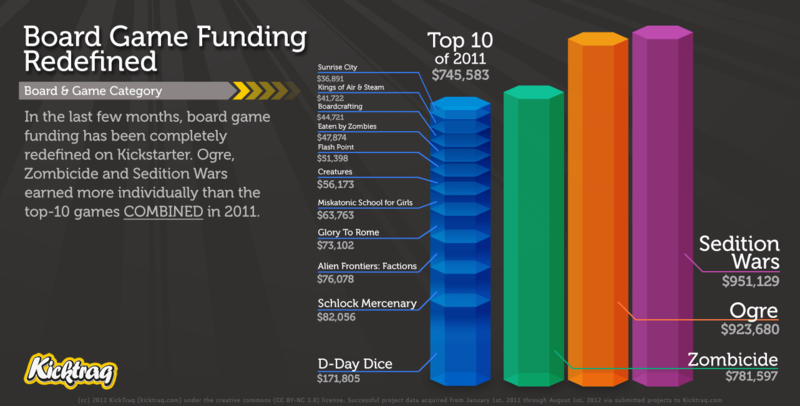 If you’d like to use these, feel free to download directly using 201208-kicktraq-gencon-infographics.zip. We’d appreciate a link back, but enjoy regardless.